BOSTON, MA--(Marketwire - Oct 26, 2012) - Whether visiting relatives or planning a holiday getaway, Boston is the perfect city for holiday fun. And with exclusive holiday rates now available, the Courtyard Boston Cambridge is proud to offer value, comfort, and convenience to its guests through the new year! Through December 30, 2012, this conveniently located hotel in Cambridge, MA is offering guests rates as low as $99 USD for a King room, and $129 for a two-Queen room. * Each room type features luxurious bedding that combines comfort and sophistication; large writing desks with ergonomic chairs -- perfect for writing holiday cards; mini-fridges, coffee makers and irons. With these special rates, guests can leave the holiday heavy lifting to the hotel staff, from roasting turkeys to decking the halls. Guests can simply celebrate the holidays at the hotel (or suggest that their family members do), and just sit back, relax and let someone else do the dishes and makes the beds! 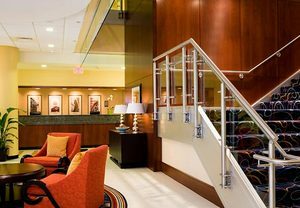 To book these rates or any Cambridge, MA hotel packages, guests are invited to visit http://www.marriott.com/hotels/hotel-deals/boscy-courtyard-boston-cambridge/ or call the hotel directly at 1-617-492-7777. To ensure their savings, guests should be sure that promotional code HOL appears in the Corporate/Promotional code box when making online reservations, or call 1-800-228-9290 in the US and ask for promotional code HOL. The newly renovated Courtyard -- a popular choice among hotels near MIT -- offers amenities that include spacious rooms with free wireless Internet, luxurious bedding, 32-inch flat-panel TVs, coffee makers and spectacular river or city views. Guests can take advantage of the hotel's superb on-site dining, which includes full-service, buffet or Continental breakfast, the Library Lounge, the Great Room and the newly opened Bisuteki Tokyo Japanese Steakhouse and Sushi Bar. This Charles River Boston hotel's ideal location near Harvard is also close to Boston University, world-renowned hospitals and some of the best restaurants in Cambridge, MA. Getting around is easy with the property's shuttle to these area locations as well as the subway. *Rates valid seven days a week through 12/30/12. Limited number of rooms are available for this promotion. Tax is additional. Offer does not apply to groups of 10 or more rooms. Offer cannot be combined with any other promotions. Blackout dates may apply. Advance reservations required. Other restrictions apply. Rates are per room, per night and based on availability at the time of reservations. Located on the banks of the Charles River, the Courtyard Boston Cambridge offers amazing views of the river, Cambridge and the Boston skyline. A popular Cambridge, MA business hotel, the Courtyard is just five miles from Logan International Airport and minutes from downtown Boston. While staying at this Cambridge, Massachusetts hotel, guests can enjoy numerous options such as an indoor pool with observation deck, fitness center, 24-hour market and a restaurant serving breakfast in the morning and cocktails in the evening. The hotel features 6 suites and 197 rooms on 16 floors. For meetings and social events, the hotel's nearly 3,000 sq. ft. of space accommodates 300 guests for memorable moments. Conveniently located among hotels near Harvard, Courtyard boasts quick access to the city's top dining & attractions.